Below is a list of frequently asked questions and corresponding answers for the WG-60 digital camera. ・Regarding Waterproof, Dustproof, and Shockproof Design. *No camera case or SD (SDHC) Memory Cards are included with the camera. What optional Mounts are available for this camera? Please see here for available optional Mounts. *These Mounts may not be usable, or may come off, under certain mounting configurations or conditions. You are advised to observe all safety precautions when using them in your shooting sessions. *This camera sinks underwater. Be careful not to drop the camera into the water by using the Leash code and others. *The leash cord for prevention of loss and drop is not included in each WG Mount. Please use the commercially available products. What are necessary other than accessories at the time of the purchase? SD memory card is optional, which is not included in the product package and needs to be purchased separately. When you want to play back image and movie on the AV device with a HDMI terminal, please prepare commercially available HDMI (Type D) cable. Can the camera be mounted on a tripod? Yes, it can. There is a tripod socket at the bottom of camera. Where is the audio microphone? Can an external microphone be connected to the camera? The microphone is on right center of the camera. The external microphones cannot be connected to the camera. Is there a function to reduce camera shake? Yes, there is a function to reduce camera shake as following. Is the AF assist light available? 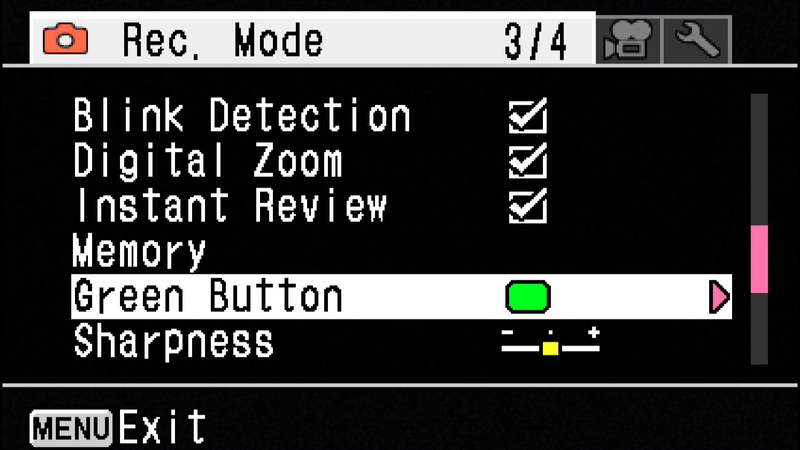 Yes, the AF assist light (Red LED) will be worked when select the [AF assist] in the menu at the dark condition. How big is the LCD monitor and how many pixels does it have? The monitor is a 2.7-inch LCD panel with approximately 230,000 dots. What is the [Outdoor View Setting] function? The image monitor can be easily adjusted to the most visible brightness according to the usage environment. The setting method is following. 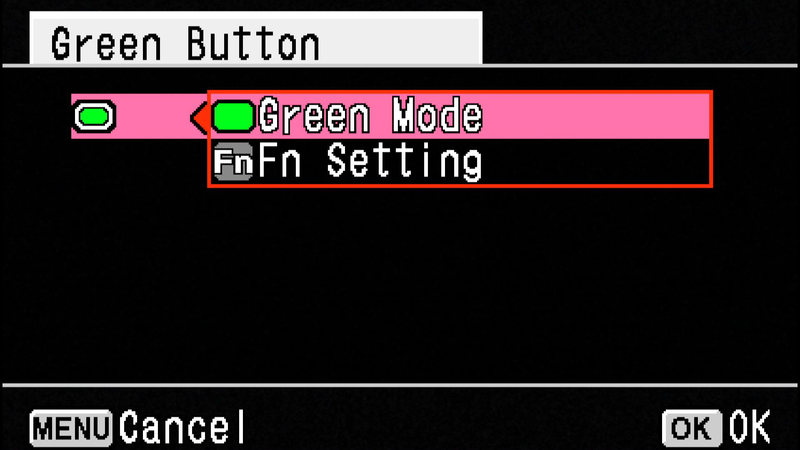 Change green button setting in Rec.Mode 3/4. 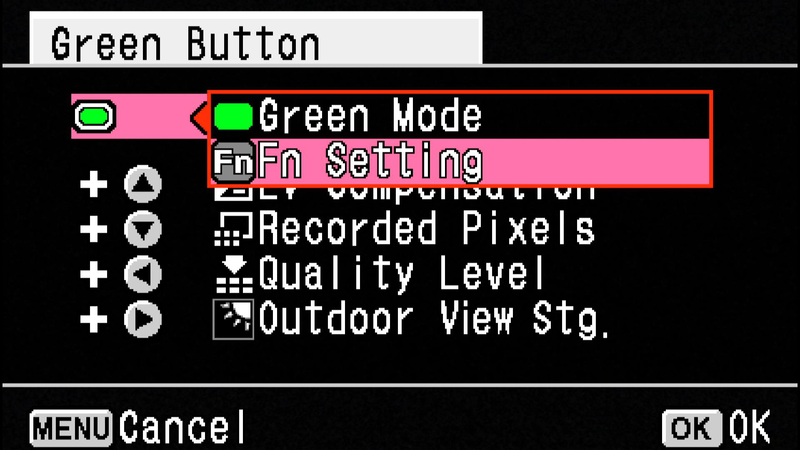 Change green button setting from [Green mode] to [Fn setting]. 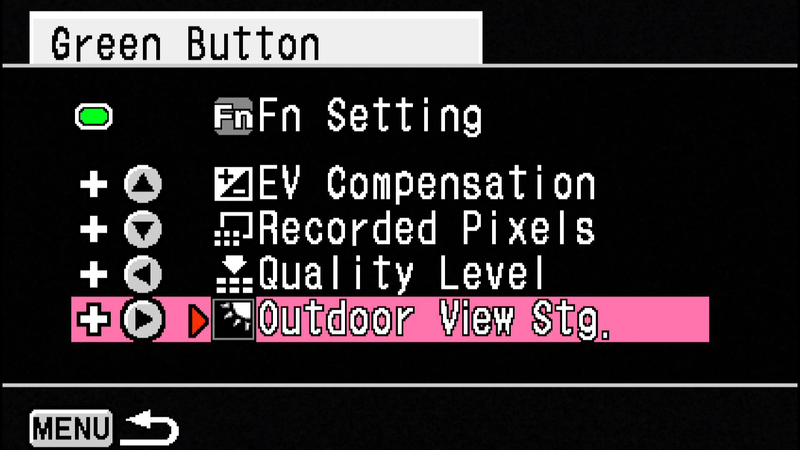 Select [Outdoor View Stg] in Fn setting. Select [Outdoor View Stg] then select [OK]. 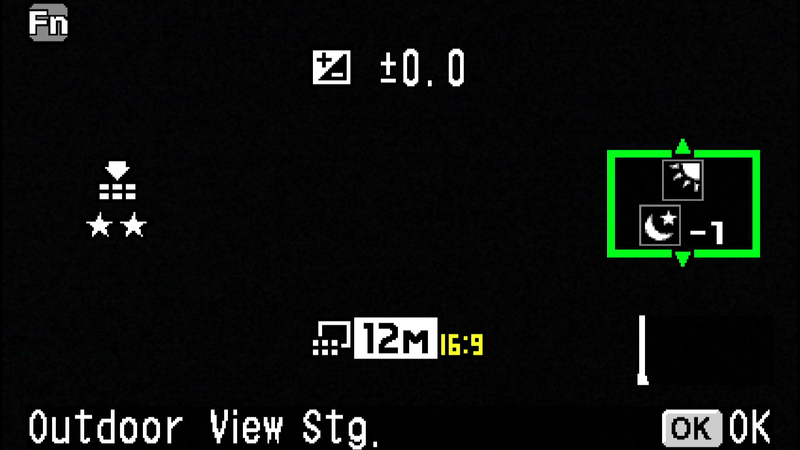 Assign [Outdoor View Stg] to green button. Press [Green Button] and display Fn menu. Adjust to most visible brightness. How is the performance of waterproof / dustproof / shockproof? ・This camera is provided with a waterproof / dustproof design complying with JIS waterproof grade 8 and JIS dustproof grade 6 (equivalent to IP68). ・The camera satisfies the PENTAX drop test (1.6m height onto a 5cm thick plywood surface) complying with MIL-Standard 810F Method 516.5-Shock testing. ・The camera satisfies the PENTAX test for the waterproof, dustproof, and shockproof performance, but this does not guarantee it will remain free of trouble or damages. ・Waterproof performance is not guaranteed if the camera is exposed to impact such as being dropped or hit. ・The camera's accessories are not waterproof. Are there any precautions that should be observed when using the camera under water? When use the camera in the water, please pay attention the following points. ・Make sure that there are no cracks or scratches on the rubber seal of the battery/card and terminal covers. ・Make sure there are no foreign objects (dust, sand, hair, lint or liquid) on the rubber seals or the surface they contact before closing the battery/ card and terminal covers. Wipe off any foreign objects with a clean lint-free cloth. ・Close the battery/card and terminal covers properly until they click. Otherwise water may get in and damage the camera. ・Avoid opening the battery/card and terminal covers when near the waterside or with wet hand. Wait until the camera is completely dry before changing the battery or the SD memory Card. Avoid changing the battery or card where the camera is likely to get wet or dirty, and make sure that your hands are dry. ・The camera will sink if dropped in water, so be sure to attach the strap and slip the strap over your wrist when using the camera in or near water. ・To enhance the waterproof performance of the camera, the front of the lens is protected by glass. As any dirt or water on the glass will affect the quality of pictures taken, the glass should be kept clean at all times. ・Do not use the camera deeper than 14m underwater. Do not use the camera underwater for more than 120 minutes consecutively. ・Do not open the battery/card and terminal covers underwater. ・Do not use in hot water or in a hot spring. ・Do not apply excessive force to the camera, for example diving into water with it. Doing so may compromise the waterproof performance of the camera or cause the covers to open. ・Leaving the camera on the sand at the beach may cause the camera to exceed its operating temperature or cause the speaker or microphone to become blocked with sand. ・Avoid subjecting the camera to substantial vibrations, shocks, or pressure as this may cause a loss in waterproof performance. If the camera is subjected to substantial vibrations, shocks or pressure, take your camera to your nearest official Service Center and have it checked. ・Avoid getting sunscreen or sun oil on the camera as it may cause discoloration of the surface. If any oil gets on the camera, wash it off immediately with warm water. ・Sudden and extreme changes in temperature may cause condensation to form in and on the camera. Keep the camera in a bag or case to reduce the difference in temperature. ・Do not open the battery/card cover or terminal cover if the camera is wet. Wipe off any water with a clean lint-free cloth. ・The inside surface of the covers may get wet when they are opened. Wipe off the any water that is on the cover. ・Wiping off the camera while there is sand or dust on it may scratch the surface of the camera. Make sure that the battery/card cover and terminal cover are firmly closed before washing the camera in tap water. After washing the camera, dry it with a soft cloth. ・Wipe off any dirt or sand on the waterproof packing or the packing contact surface. The camera's waterproof performance may be compromised by loose packing or cracks or dents in the packing or packing contact surface. If there is any such damage, contact your nearest official Service Center. ・Avoid cleaning with agents such as soapy water, mild detergents, or alcohol as this may compromise the waterproof performance of the camera. Is there a waterproof case (under water housing) that can be used in a deeper place? There is no scheduled at the moment. What are the storage media? The built-in memory (approximately 68MB), SD, SDHC, SDXC Memory Cards and FlashAir Card. Compatibility with the WG-60 has been tested with memory cards from the below manufacturers. *Please update FlashAir card to the latest firmware. Before using FlashAir card to WG-60, please carry out the initial setting beforehand with FlashAir card setting software. *It is not compatible with Eye-Fi interlocking function. *The information above is given for the convenience of customers and does not guarantee complete compatibility with the WG-60. *This camera is not support UHS speed class, but you can use it. *This camera is not support SDXC card that exceeded capacities of 512GB. Does the camera come with an SD Memory Card? No. Memory Cards should be purchased as required purpose. Is the camera responding to the UHS speed class? No, but you can use it. Can the Micro SD and mini SD memory card be used? Please use SD, SDHC, SDXC or FlashAir card. Card that are unused or that have been used on other devices, such as another camera or a computer, must first be formatted on the WG-60. *Please note that formatting will delete any data recorded on the card. Are there any precautions needed when using SD Memory Cards? ・Do not turn the camera off while you are recording data. ・Card that are unused or that have been used on other devices, such as another camera or a computer, must first be formatted on WG-60. ・Make sure that the camera is turned off before inserting or removing the SD Memory Card. ・When changing the SD Memory Card, avoid places where the camera is likely to wet or dirty, and Make sure that the camera and your hands are completely dry. ・Avoid using or storing the card where it may be exposed to static electricity or electrical interference. ・If a card is left unused for a long period, it may no longer be possible to read the data stored on the card. Important data should be backed up regularly. *We do not accept any liability for data that is deleted with any reason. Are there any precautions needed when using FlashAir Memory Cards? ・Before using FlashAir card to WG-60, please carry out the initial setting beforehand with FlashAir card setting software. ・It is not compatible with Eye-Fi interlocking function. ・When the FlashAir card is removed while the WG-60’s camera power is on, wireless LAN function of FlashAir card cannot be used temporarily with other cameras. In that case, insert the FlashAir card in the WG-60 camera with power off condition and turn on the camera then turn off the camera and remove the FlashAir card. If still the same condition, please set up wireless LAN startup with FlashAir card setting software. ・Do not format the FlashAir card with camera other than WG-60 camera. The wireless LAN function of FlashAir in WG-60 will be temporarily unusable. Please initialize FlashAir card and set up wireless LAN start up with FlashAir setting software. For details, please refer to the instruction manual of the FlashAir card. How long can the rechargeable lithium-ion battery D-LI92 are used for? *The playback time and movie recording time are based on the result of in-house testing. It is result of a measurement and not guarantee for using time and number of still images. Can the battery be charged when connect the camera to computer via USB cable? Yes, please charge from outlet by using the Power adapter and USB cable. Please turn the camera off while charging. Is there the battery charger that doesn’t use the camera? Yes, it is Battery Charger Kit K-BC92J. It is a set of Battery Charger(D-BC92) and AC Cord(D-CO2J). There is the optional AC adapter kit K-AC117J. You cannot charge the battery in the camera with AC adapter. When the battery is removed, how long is the date set in the camera retained? And does the internal clock keep running? Once a new battery has been loaded and left in the camera for at least 1 day, data in the camera remains backed up for approximately 1 day when the battery is removed. The internal clock also continues to run while the data is backed up. Can the ISO sensitivity be set in manually? Yes. You can choose [AUTO], , , , , ,  and  from the setting menu. *When [D-Range Setting] is set to [Highlight Correction: ON], you can’t choose ISO  and . You can choose minimum from ISO . *When set the [Shake reduction: ON], you can’t choose ISO  and . You can choose maximum from ISO . Can set the ISO sensitivity of AUTO? You can set [125-200], [125-400], [125-800] ,[125-1600] ,[125-3200] and [125-6400] from [AUTO ISO Range]. *When capture mode is set to [Report], AUTO ISO Range is fixed to [125-6400]. Expands the dynamic range and prevents bright and dark areas from occurring. [Highlight Correction]: Highlight correction adjusts the bright areas when the image is too bright. [Shadow Correction]: Shadow correction adjusts the dark areas when the image is too dark. *When [Highlight Correction] is set to ON, the minimum sensitivity changes to ..
What is the IQ Enhancer Processing? You can take pictures with clearer details by using image processing with the IQ Enhancer technique. -When the drive mode is set to [Burst Shooting]. -When the shooting mode is set to [Pixel Track SR]. Is there the [Report] capture function? Yes. 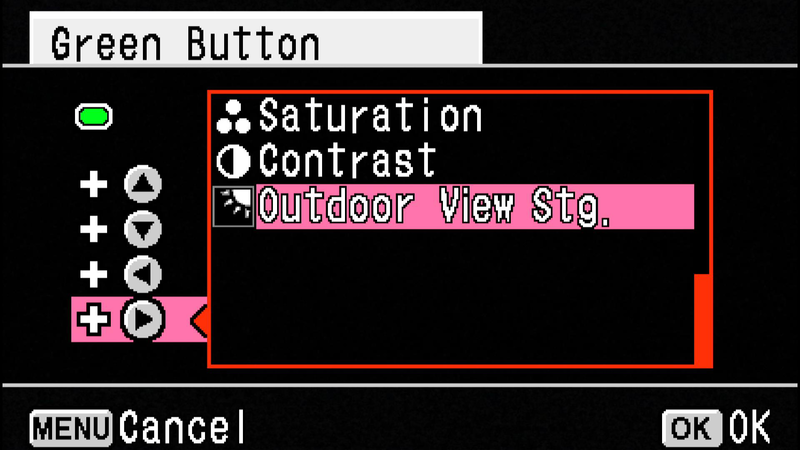 Please choose from Capture Mode Palette. *The ISO sensitivity range is fixed at [125-6400]. *If sensitivity set at [AUTO], the Pixel Track SR is fixed to OFF. *The Digital Zoom function is not usable with this mode. Can set the Image size be set at [Report] mode? Yes, you can select from [3M], [2M] and . What is the compression ratio of each image size on [Report] mode? The compression ratio is following. *Compression ratio and file size will vary depending on the setting of Quality level. *Number of pixels for 1280(1280x960) is Approx. 1.2M pixels. *The file size varies depending on the shooting subject. Can Remote control be used? Yes, please use the Remote Controller O-RC1 (optional). *You cannot use Remote Controller at underwater. *The battery for Remote Controller is not changeable. *You can select [Three seconds release] or [Immediate release] by Drive mode. *In Movie mode, pressing the shutter release button again stops the recording. *The operating range is approx. 4m from the front of the camera and approx. 2m from the back of it. *It is not support capture image with the camera located underwater. Combines 3 images into a single image delivering a wider dynamic range image. *The flash does not discharge in this mode. *The ISO sensitivity is fixed at “AUTO”. What is [Digital Microscope] mode? In the Digital Microscope mode, you can take pictures of objects as close as 1cm, also the lights around the lens are always lighted, you can take minute pictures of text, the veins of leaves, or specimens of tiny insects etc. *Attaching the supplied macro stand (O-MS1) reduces camera shake during macro photography. 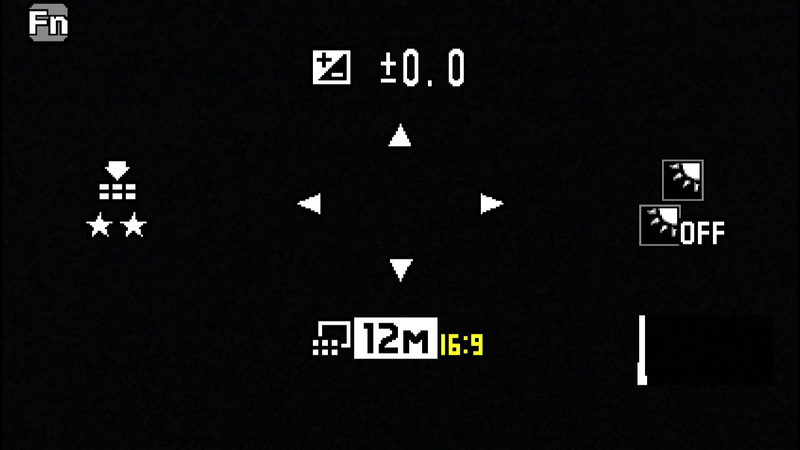 *The number of recorded pixels is fixed at 2M (16:9). *The focus mode is fixed at 1cm Macro. *The Face Detection function and the blink detection function are turned off. *The illumination of the macro lights may be uneven or insufficient depending on the shooting conditions. Yes, the following settings can be set. - Interval: 10 sec. ~99 min. - Number of shots: 2 shots~1000 shots. If the start time is set to 0 minutes, the first picture is taken as soon as the shutter button is pressed. What is the setting item of interval movie? You can set following item. *In this mode, you can record multiple still pictures taken automatically at a set interval from a set time, as a movie file. Sound cannot be recorded during interval movie recording. Interval Set the shooting interval to 1minute, 5minutes, 10minutes, 30minutes or 1hour. Start Delay Set the start delay, from 0minutes to 24 hours. You can set this in 1minutes increments. If the start time is set to 0minutes, the first picture is taken as soon as the shutter release button is pressed. *For interval movie recording, the following settings are fixed. *When you use the SD Memory Card, use SD Speed Class 4 or higher cards. What is the recording format and size of movie mode? You can set from 1920x1080(30fps), 1280x720(60fps) or 1280x720(30fps). *The maximum recordable time of a file is 25 minutes. Can the camera focus be adjusted during movie recording? Can the zoom be used during movie recording? Only the digital zoom can be used. Can the sound be recorded during movie recording? Yes, you can record monaural sound in PCM system. *Operation sound may be recorded. Please tell me the supported OS to connect the camera to PC with USB cable. The supported OS is as follows. *It is necessary for the target OS to be update to the latest version on the preinstalled PC and the USB port as standard equipment. Please tell me method of the transferring images to PC with USB cable. Turn the camera ON and connect the camera to PC with USB cable. The PC will automatically detect the camera as a removable drive. Double click the removable drive icon to access the file, and movie and still image copy to PC. *Set the "USB connection" to "MSC" of "Setting” menu. Can use this camera as PC camera? Does the camera come with the application software? Does the camera support the "Digital Print Order Format (DPOF)"? The flash does not fire? If setting is as follows, flash does not fire. 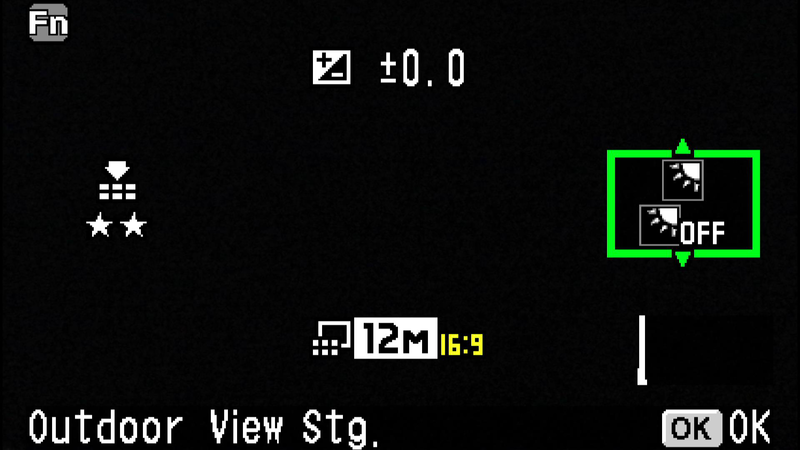 1.Is the shooting mode set to [HDR], [Handheld Night Snap], [Movie], [Interval Movie], [High speed Movie], [Digital Microscope] or [Fireworks]? 2.Is the drive mode set to [Continuous Shooting], [Burst Shooting] or [Auto Bracketing]? 3.Is the focus mode set to [Infinity] ? 4.Is the flash mode set to [Flash Off]? The flash fired but the photo is too dark. 1.The subject is too far away in a dark location. If the subject is too far away, the picture becomes dark because the light of the flash does not reach the subject. 2.The background is too dark. When you photograph someone against a dark background, even if your subject is correctly exposed, the light from the flash may not reach the background, so that it appears too dark in the resulting image. You can take a picture that perfectly captures both your subject and nighttime scenery by selecting [Night Scene Portrait] mode (with the [Flash On] flash mode selected) and using a tripod. How do I switch from using the camera's built-in memory to using an SD Memory Card? There is no selector switch for this. When an SD Memory Card is inserted into the camera, data is recorded onto the SD (SDHC) Memory Card. If there is no SD (SDHC) Memory Card in the camera, data is recorded into the built-in memory. No data is recorded in the built-in memory while there is an SD Memory Card in the camera. *Make sure that the camera is turned off before inserting or removing the SD Memory card. Can data in the camera's built-in memory be copied onto an SD (SDHC) Memory Card? - Press the four-way controller (down) two times to select [Image Copy]. *This function can only be selected when an SD Memory Card has been inserted in the camera. *All the images in the built-in memory are copied to the SD Memory Card at once. Before copying the images, make sure that there is enough space on the SD Memory Card. Can I reset the file numbers at 0001? Yes, it can reset the file number. *Before beginning this procedure, you should back up the data in the camera’s built-in memory or on the SD Memory Card. - Press the four-way controller (up) 8 times to select [Memory] in [Rec. Mode 3/4]. - Press the four-way controller (right) once to display [Memory]. - Press the four-way controller (up) once to select [File No.] in [Memory 3/3]. - Press the four-way controller (left/right) to clear the checkmark from the [File No.] setting. - When you use the Memory (SD or Internal) with no image file after performed [Format] or [Delete All], the file numbering restart at 0001 from your next shot. *If any of the images are protected, the numbering may not revert to 0001. Remove the protection and use [Format] or [Delete All] again. Can images be displayed on an analogue television? No, it is not supported analogue television, please watch the images the television with HDMI terminal. Can I input the date or time into image file? Yes, you can input date or time into still image. - You can select “Date”, “Date & Time”, “Time” or “Off” at [Date Imprint] in [Rec. Mode 4/4]. *The Date and time in image cannot be deleted.